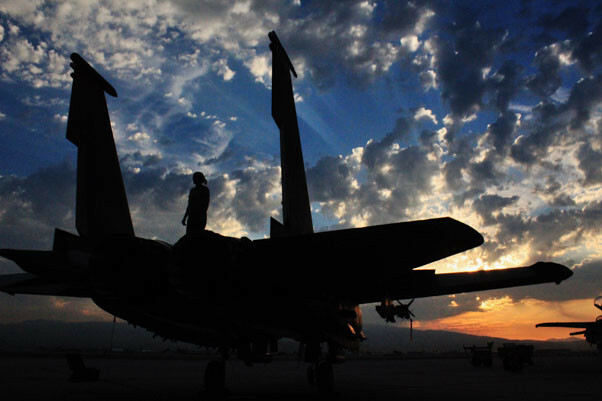 MOUNTAIN HOME AIR FORCE BASE, Idaho — As Col. Michael Lawrence, the 366th Maintenance Group commander, riffled through pages of bullets highlighting the group’s 2015 achievements, he came across a photo of a nearly-unidentifiable airman standing atop a shadowy F-15E Strike Eagle. “On the front page of this package is [Airman 1st Class] Kristin Hall from Opp, Alabama,” Lawrence said as he pointed to the mysterious figure. Hall didn’t know it, but she’s the first image seen on Mountain Home Air Force Base’s Clements McMullen Memorial Daedalian Weapons Systems Maintenance Trophy package. The 366th MXG “Regulators” won Air Combat Command’s nomination for the Air Force-level award. The photo is a small snapshot of the many months maintainers spent away from home during 2015, working in Korea, Hawaii, Nevada and nearby Gowen Field. “It always seems like a lot to a young airman,” said recently-promoted Senior Airman Hall, a former 389th Aircraft Maintenance Unit crew chief. She’s one of many maintainers who entered the military during a time of budget constraints and force shaping, and hit the ground running. “It’s kind of a blur,” remarked Hall, reflecting on her transition from Alabama overalls to Air Force coveralls. Lawrence’s ability to identify one of his hundreds of Regulators came as a surprise to Hall, who is one of many maintainers who aren’t privy to the “big picture,” whether it’s a nomination for an Air Force-level award, or the true impact they have on the mission. In a low-manning environment, the process of fixing an aircraft can often turn into an airman fixing a process. This, incidentally, is the spirit of the Daedalian award. The word “Daedalian” comes from the mythical Greek inventor Daedalus. “They’ve been telling us that we have to do more with less,” Luke said, speaking first-hand about some changes to his job. 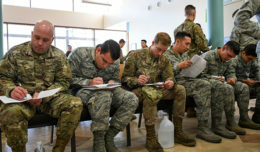 He was one of many airmen who learned tasks from other career fields, saving hundreds of man hours throughout the year. This sparked ideas from airmen across the group, like crew chief Senior Airman Corey Bethel, who had an idea to improve faulty door fasteners on travel pods, which are used for cargo storage in-transit. “I just saw it and thought there was a better way to do it,” Bethel said about submitting his idea. Other accomplishments include revisions to 24 precision measurement equipment laboratory processes which saved the Air Force approximately $1 million across five major commands, and maintaining aircraft in three locations in less than 90 days – all while training other MAJCOMs in their processes. While Bethel’s idea is one whose origins can be traced, it’s unclear as to where some of the others came from. But it’s taken a lot of work to get to this point. 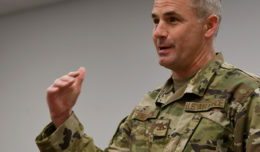 The 366th MXG Deputy Commander, Lt. Col. John Jacobus, was stationed at Mountain Home Air Force Base many years ago and paints a different picture of the 366th MXG. Now, he says he’s never seen a better maintenance group – driven by young airmen consistently performing in stressful, sometimes painful conditions. In a way, maintainers are a paradox. They’re both proud, yet humble. 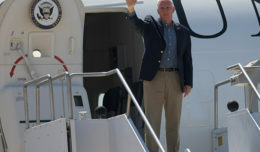 An officer will say the enlisted are responsible for the work, a noncommissioned officer like Luke will say it’s the younger airmen, or a combination of efforts. And the airmen? Many of them are like Hall and Bethel – young faces in a pool of faces that are younger still, all working to get a job done. Bethel, Luke and Hall say they don’t do it for the fame or the recognition, or for a rare shot at an even rarer award. They do it because, at their very core, that’s just what they do. Some people would see the picture of Hall and the F-15E simply as good photo. Others might not see it as significant at all; Hall almost didn’t. Lawrence and Jacobus, though, see something far more insightful. “It’s these young faces,” Jacobus said, smiling as he closed the award package and pointed to a cluster of photos depicting the young faces of the Air Force. They see the backbone of the maintenance career field, the innovative spirit of a Mountain Home AFB “Gunfighter,” the reason the mission gets accomplished day after day at location after location around the world. They see a young face.